Yay! I'm so glad something good came out of this. Aww yay! Congrats Alisha! I really do love your cage and I'm glad you won :] That's a great way to spend the giftcard, you're so thoughtful and I'm sure your parents and dog will be grateful. How much is the gift card for? It didn't work for me, either, Aertyn. I am so glad a C&C cage won and a GL member to boot. I thought for certain we were going to get beat out by a rat or a ferret cage. Those are so full of activity. And poor Guinea Pigs are couch potatoes! Thanks everyone! Pikatot: it's a $200.00 Petco Giftcard. My 5 wonderful guinea pigs live in a C&C (cubes and coroplast) cage. 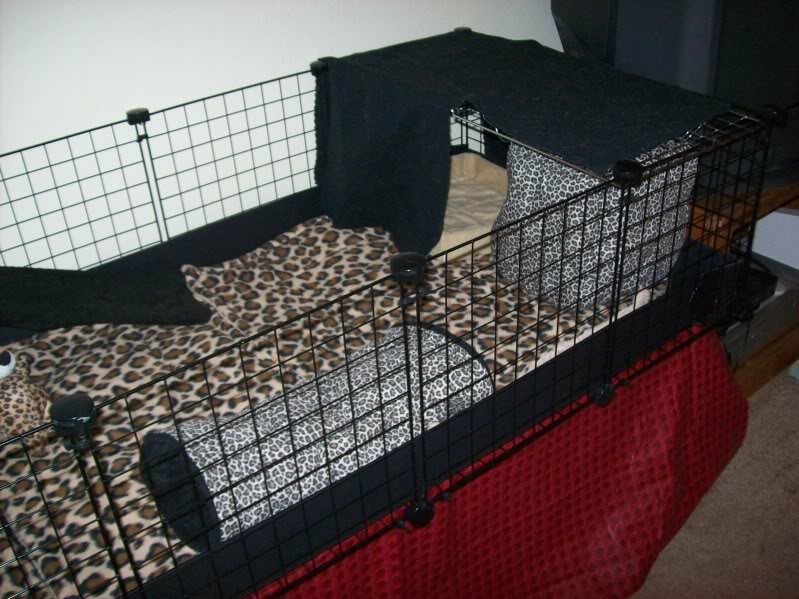 It was extremely easy to build and it has lots of space for them to run around and do "zoomies" in. They have fleece as their bedding which makes it real nice under their tender feetsies! The first level is the common area for play and sleep time and the second level is for food! I use care fresh or shavings in the bottom of their LARGE hay bin. Piggies need lots of hay and good healthy pellets, along with fresh veggies everyday. 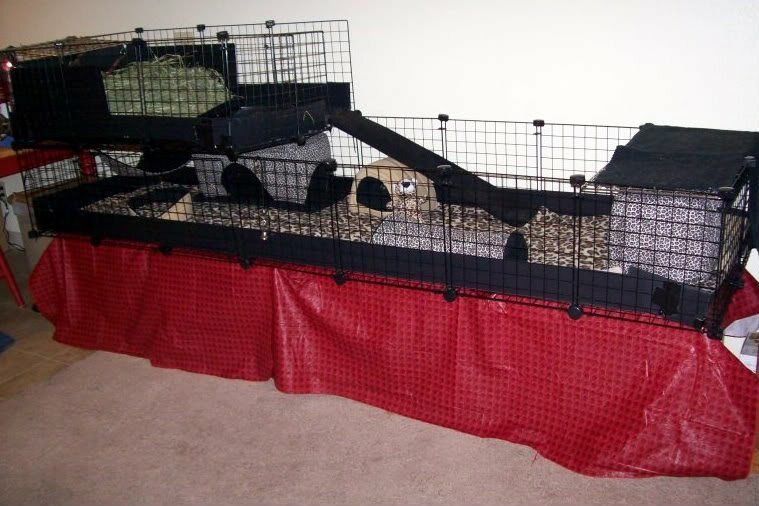 My 5 guinea pigs are living the life in their Leopard palace! *I forgot to mention that 4 out of the 5 are rescued piggies. I love the black coro with the leopard pattern. Very awesome. And the tablecloth underneath is the perfect color too. 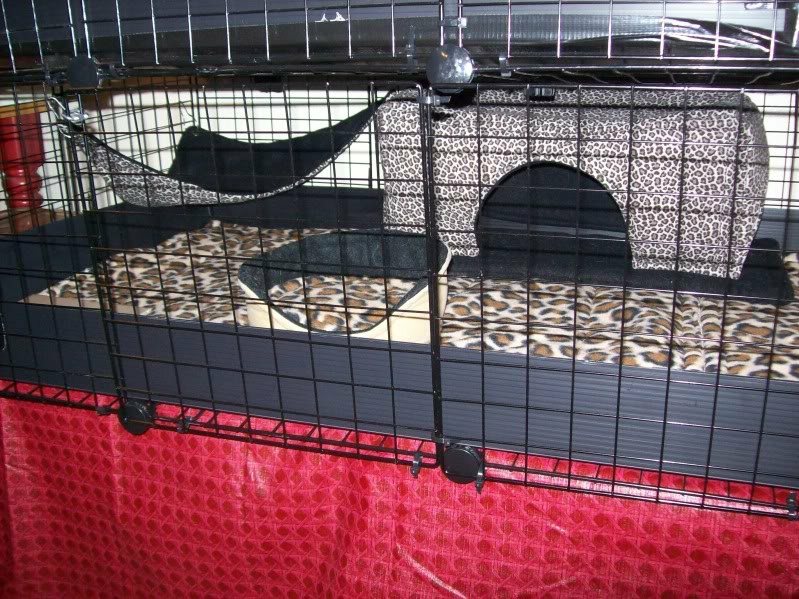 Awesome cage :) Where did you get the hammocks from? I'm after some corner hammocks for my piglets but can't find any that I like. Hopefully other people will have seen all of the C&Cs and realized that those cages are ideal for guinea pigs. Thanks TexCavy, after I got Jens stuff I HAD to get black coroplast. And the table cloth is a life saver. My $8 steal at Walmart haha. Aertyn: I got it from Jens Custom Crafts, just like Jen posted. I love her products! This is great! Congrats on winning. You have a very nice setup there.